Earlier this month, I became a team member of The Human Longevity Project. The mission of the project is to look at what we need to do to create a brighter future, especially for our children, grandchildren and great grandchildren, in light of the dramatic rise in chronic diseases that we are experiencing. 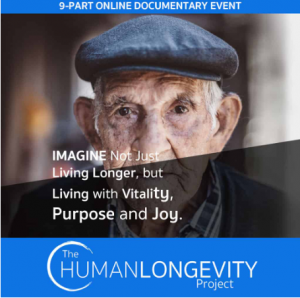 The Human Longevity Team traveled to regions of the world where individuals routinely live into their 80s, 90s and 100s, virtually free from chronic disease, looking for answers as to how we can live longer, happier and more fulfilling lives. As host and director Jason Prall explains, what started out as a 60-minute documentary has expanded into a nine-part series. The series features interviews with more than 90 health experts and insights from some of the world’s healthiest and longest-living individuals. For the first time in the history of the United States, experts predict that the current generation of children will live shorter lives than their parents. We have seen a dramatic decrease in physical activity. Our health care system does a fantastic job of taking care of acute healthcare problems but is not equipped to properly handle chronic disease. Our current theory of disease does not match the facts. Your genes have little to do with your future. Diet, exercise, sleep and stress impact cellular health. Your gut is the center of your health. Avoidance of stress is not healthy. Humans, dogs, cats and plants do not thrive in a stress-free environment. Our expectation that doctors prescribe a pill or perform a procedure to solve our health problems is a problem. We need to take personal responsibility for our health. We control the foods we eat; when and how we move our bodies; the things we think about and how we think about them; who we hang out with; and how much sleep we get. Meaningful social connections are one of the key factors to living a longer, happier and more fulfilling life. We need to quit trying to paper over meaningful social interaction with social media. We have to find our purpose in life – something to live for. For more information on The Human Longevity Project, click here.